Behold: the dawn of the merbot. A group of underwater archaeologists exploring the sunken remains of King Louis XIV's flagship La Lune added a very special member to their dive team recently. 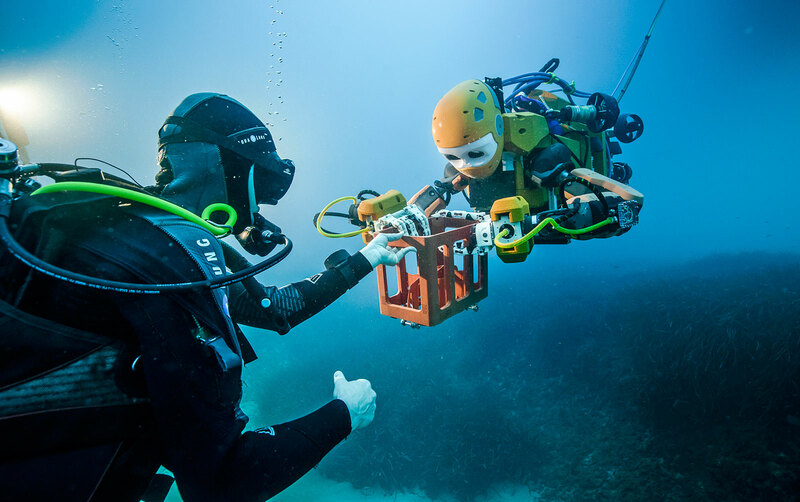 OceanOne, a Stanford-developed humanoid diving robot with "human vision, haptic force feedback and an artificial brain," made its maiden voyage alongside human divers to recover 17th-century treasures from bottom of the Mediterranean. Stanford's five-foot "virtual diver" was originally built for studying coral reefs in the Red Sea where a delicate touch is necessary, but the depths go well beyond the range of meat-based divers. The "tail" section contains the merbot's onboard batteries, computers and array of eight thrusters, but it is the front half that looks distinctly humanoid with two eyes for stereoscopic vision and two nimble, articulated arms. Those arms are what make OceanOne ideal for fragile reef environments or priceless shipwrecks like La Lune, which sank off the coast of France over 350 years ago and hasn't been touched until now. Force sensors in each wrist transmit haptic feedback to the pilot, allowing them to feel the object's weight while staying high and dry on a dive ship. The robot's "brain" works with the tactile sensors to ensure the hands don't crush fragile objects, while the navigation system can automatically keep the body steady in turbulent seas. With such a nimble platform, OceanOne will also prove useful in dangerous undersea environments like the Fukushima Daichi site that claimed five other robot divers. Suddenly, the imploded ghost of Nereus is looking downright clunky.